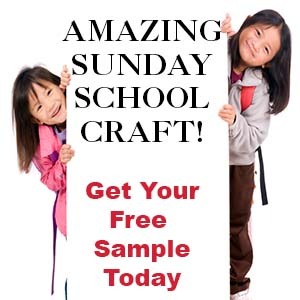 The following crafts and activities come from the Sunday School lesson "Do the Right Thing for the Right Reason" on The Resource Room. 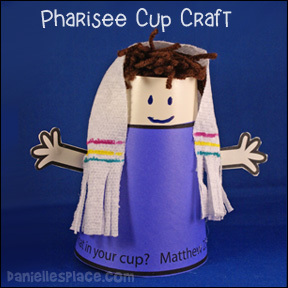 This lesson is based on Matthew 23 where Jesus talked about the Pharisees who "clean the outside of the cup and dish, but inside they are full of greed and self-indulgence". Appropriate for 3rd through 5th grade. Through this lesson children learn that is is not only important to do the right thing, but to do it for the right reason. This lesson is available to members on The Resource Room and as an instant digital download. All you need is yarn, paper cups, paper towels, paper, and markers. Printable patterns are available to members and as an instant download above. 1. Before class print out the "What's in your Cup?" sayings onto colorful paper and the Word Patterns onto white paper and cut them apart. 2. 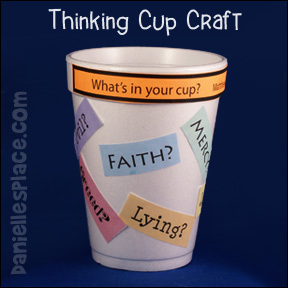 In class have your children glue the "What's in your Cup?" saying to the rim of the glass and the words all over the rest of the cup. 3. Tell your children and parents that each night during the week they should talk about what was in their child's heart. Were they helpful, kind, obedient, etc.? The children's parents should write words describing their child's behavior on pieces of paper and place them in the cup each night. If a bad word goes into the cup, they should pray about it with their child and ask God to help them not do that the next day. If the child is successful, he can take the word out the next night. 1. Before class make puppet hair by winding yarn around your four fingers about 25 times. Pull it off your fingers keeping the yarn in the same shape and tie the yarn together in the middle with another piece of yarn. Cut the looped ends to make a pompom. 2. In class have your children glue the pompom to the bottom of the cup for the hair, stick on eyes, and draw on a face. 3. Punch a small hole in the face for the nose. Children will stick their hands in the cup and put their pointer fingers through the hole for the nose. 4. 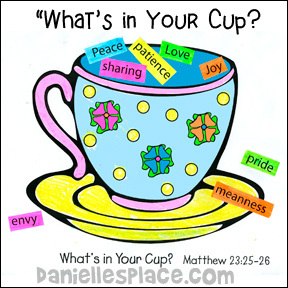 Print out the "What's in your Cup?" sayings onto colorful paper and cut them out. In class have your children glue them to the rim of the glass. 5. 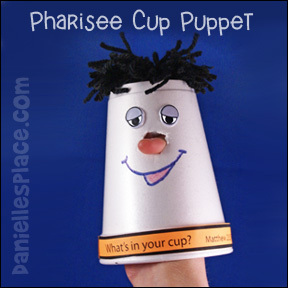 As you work remind your children that Jesus compared the Pharisees to a cup that was dirty inside. Ask them to think of some bad things that Jesus doesn't want us to have in our hearts - greed, envy, lying, laziness, bad words, etc, and have them think of good things Jesus would want us to have in our hearts such as love, kindness, helpfulness, patience, etc. The Pharisees did everything for show. Jesus said, "Woe to you, teachers of the law and Pharisees, you hypocrites! You clean the outside of the cup and dish, but inside they are full of greed and self-indulgence. Blind Pharisee! First clean the inside of the cup and dish, and then the outside also will be clean. 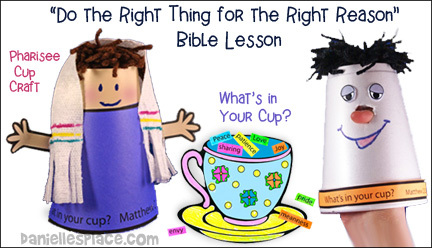 For this activity children decide which words should go inside the cup and which should stay out. They cut apart the words and decide if they should be glued to the inside of the cup or left out. 1. Before class print a bunch of words on pieces of paper and place them in a large cup. Use words that describe things we don't want in our hearts and things that we do. 1. In class have the children take turning trying to throw a ping-pong ball into the cup from a short distance away. 2. If a child gets the ping-pong ball in the cup, he gets to pull out a word. Read the word for him and ask him if that is something Jesus would want us to have in our hearts. If it is, he gets to keep the word. The child with the most words at the end of the game wins. 1. Before class make the inside of one cup dirty or write the words: greedy, hypocrite, liar, etc. on the inside of the cup. Make sure the words don't show through the cup.